Jack Kahuna Laguna – From SpongePedia, the biggest SpongeBob-wiki in the world! 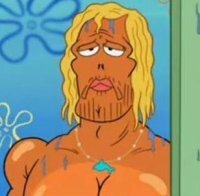 Jack Kahuna Laguna appears in SpongeBob SquarePants vs. The Big One. His nickname is JKL. He is voiced by Johnny Depp. He lives in a grass hut on Kahamamoku Cove. He has a very long surfboard. He told SpongeBob, Patrick and Squidward about the The Big One and that one of them had to sacrifice himself. Finally he was the sacrifice, but before the Big One ate him, he said:"I was born to do this". He actually survived the Big One and joined the party with Spongebob, Patrick, Squidward, Mr. Krabs, Sandy, etc. He also saved Cashy. He may be a fish, or a merman, like Mermaid Man and Barnacle Boy. He probably is a merman, since fish can't have hair, but this can be debated considering some female fish have hair, and in the episode, Krabby Road, patrick grew his own hair in various areas. This page was last modified on 12 October 2013, at 19:26. This page has been accessed 14,486 times.